I don't blame Shaquille O' Neal for changing his mind to not interview for the Orlando Magic General Manager position. He was smart enough to know that he had a good TV gig and stayed with it. If he were the GM, O'Neal would have to work tons of hours to restore some credibility back to the Orlando Magic franchise which is in transition. The recent firing of Coach Stan Van Gundy and the uncertainty of confused superstar Dwight Howard would give any GM reasons to take bottles of Tylenol. O'Neal didn't pull a Classless Act like former Miami Dolphins QB Dan Marino, who was named Senior Vice President of Football Operations in 2004, but resigned three weeks later. Marino knew he couldn't handle the work load and challenges to transform a franchise that made him a Hall Of Fame Quarterback, much less the fact that the Dolphins haven't won a championship since the early 1970's. He moved quickly to remain with CBS and not lose his television job. Florida Gators Men's Basketball Coach Billy Donovan must be relieved that he stayed in Gainesville after watching Van Gundy get terminated. How would you like to be called the best strategic coach by your boss CEO Alex Martins, whose background is in Public Relations, and you still get fired? The real truth is that Van Gundy and Howard simply didn't get along, as this is a common occurrence in the NBA, where the coach gets fired and the superstar stays. Van Gundy and Howard couldn't work together. I'd like to see what coach could co-exist with Howard. I have a gut feeling that Patrick Ewing will be the next coach of the Magic because he's mentored Howard to play center. He's learned from Van Gundy and has paid his dues as an assistant coach. Plus Ewing is low-keyed and has learned lots of valuable lessons from Pat Riley and his college coach John Thompson. Dwight should get an endorsement deal with Waffle House Restaurants. He waffles about his future and there are plenty of Waffle Houses on interstates around the USA. Howard doesn't know if he's coming or going. 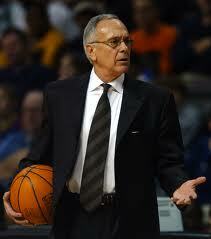 Who will be the next coach of the Charlotte Bobcats? In addition to talking about Auto Racing on Memorial Day Weekend, Basketball Country has another topic to discuss as to who has the guts to take over the worst team in NBA History? Owner Michael Jordan's front office reputation has reached an all-time low. I think-70-year old Jerry Sloan or Van Gundy would be excellent choices. Sloan is 1221-803 with a .603 winning percentage and is 98-104 in the playoffs. He won two Western Conference Finals, only to lose to Jordan's Bulls in the NBA Finals. Sloan spent 23-years as the Utah head coach before resigning in February of 2011. Van Gundy had two pressure cooker jobs in Miami and Orlando. He posted a 371-208 mark with a .641 winning percentage. He was 48-39 in the playoffs. He guided Orlando to one NBA Finals Appearance plus won a championship ring as Pat Riley's leading strategic assistant in Miami. If Van Gundy's as good as Martins says he is, then Jordan better open up the checkbook and move quickly to hire Stan before someone else does. The Bobcats are so bad that no player on this team will disrespect Van Gundy's basketball success or knowledge. The man has excellent credentials. Even though the Magic said they will honor the final year of his contract, and he could take a year off to get refreshed, it would be a good idea for Van Gundy to get a new start immediately. The Charlotte job would be a great situation because he would have a chance to take a bad team that has one way to go and that's up. He doesn't need public relations skills here. All Stan has to do is teach, run thorough practices, have plenty of dry markers and erasable boards to draw up plays. Yet my gut feeling says that Van Gundy will take the year off to recharge his battery. After what he's been through with Howard the past few years, he's probably aged about 10 years and he can just pursue the right situation. With that said, then Charlotte better hire Sloan because he's the third winningest coach in NBA History and his credentials speak for themselves. Whoever coaches this team should worry less about Jordan because Michael, isn't in a position to be much of a distraction or be a determinate because this franchise can be compared to the old Charlotte Coliseum. It has been imploded and has at rock bottom. Charlotte finished 7-59 with a .106 winning percentage, the worst in NBA history. It would be embarrassing to think that the North Carolina Tar Heels, who made it to this years Final Four in New Orleans, and are coached by legendary coach Roy Williams, could compete or defeat this lowly franchise. I wouldn't bet against it. Although I'd still like to attend one Kentucky Derby before I die, I believe that the Indianapolis 500 is the better event. It's hard for me to fathom the thought that I would travel to see an event that lasts just a few minutes as the Derby does. The Indianapolis 500 generally lasts 3-5 hours, has accidents, close finishes and the speeds go over 200 miles-per-hour. Danger or risk can give anyone an adrenaline rush. I'm proud to have attended a couple with my lifelong friends George Eichorn and Stuart Bloom. Speaking of the Indianapolis 500, I'll still watch the race but don't ask me to name drivers. Dan Wheldon passed away in an accident at the Las Vegas Motor Speedway last fall. Meanwhile, NASCAR lured Danica Patrick this season. Tony Stewart and Juan Pablo Montoya also used to be regulars in Indiana. Patrick was very competitive at "The Brickyard," has led laps, and now she gets to challenge NASCAR's longest race of the year, "The Coca Cola 600." Last year Dale Earnhardt Jr. ran out of gas on the final lap of the Coca Cola 600. Now Earnhardt has gone 140 races in a row without a win. There have been 26 different drivers that have won since Dale Jr's last triumph. What's more pressure, snapping the winless drought, following in the footsteps of his legendary father Dale Sr. or driving for Hendrick Motor Sports? Thus far, 2012 has been the year of "The Underdog." It began when the 9-7 New York Giants defeated the New England Patriots 21-17 in the Super Bowl. The Giants were the last team to make the playoffs. I never thought I'd see the Los Angeles Kings reach the Stanley Cup Finals. But you can be rest assured that NBC is thrilled. Take note NFL, when you have a franchise in the No.2 Media Market, then the television ratings are destined to be excellent. The No.8 seeded Kings shocked the No.1 Vancouver Canucks in the opening round. Los Angeles followed that up by stunning the No.2 St. Louis Blues then skated their way into the NHL Finals by ousting the No.3 seeded Phoenix Coyotes. The Kings haven't lost a road game in this year's playoffs. Now they get to face the No.6 New Jersey Devils. If the Kings can at least win one road game, though I predict they'll win two, then they can beat the Devils. Since I'm a West Coast person at heart and I really enjoy Los Angeles, there is no doubt I'm rooting for the Kings to prevail. New Jersey is accustomed to taking a bus on many of it's road trips since it plays in the Eastern Conference. Now the Devils will have to take an airplane and adjust to the three hour time difference in a 2-2-1-1-1 travel format. My Detroit Red Wings are used to the extensive travel schedule and they're in the Eastern Time Zone. No sympathy for the Devils here. The Kings are accustomed to piling up frequent flyer miles and their shortest trip is to Anaheim to play the Ducks in Orange County. No matter who wins this match-up, it will be the lowest seeded champion to hoist Lord's Stanley Cup. Ironically, the Devils with the No.5 seed were the previous lowest team to do it. This series gives me chills down my spine when scrutinizing the nicknames. We have the "Devils" versus "Kings" which would make any biblical religious buff's imagination cringe. Speaking of underdogs, Doug Collins did his best coaching job ever as he led his Philadelphia 76'ers to the Eastern Conference semi-finals only to lose the series 4-3 to the Boston Celtics. This series saw two of the classiest people and coaches take entirely different teams in Collins and Doc Rivers. There was the youth of the 76'ers against the older and experienced Celtics. The No.8 seeded 76'ers defeated the No.1 Chicago Bulls and in the process Collins squad piled up post-season experience. They were working on House Money as Collins squad figures to only get better with age. Meanwhile, the Celtics made one of the classiest plays ever by taking a 24-second violation and not running up the score which was 85-75. To see Collins and Rivers hug the way they did shows that they are two of the finest people in basketball. If you're a Philadelphia 76'ers fan, the sky is the limit with this young group and if they add a player or two, then I wouldn't be surprised to see them contend for an NBA title within three years. Back to the Los Angeles Kings. Everybody thought the LA Clippers and Lakers would be playing longer in the spring. Instead, the Kings have the Staples Center all to themselves and Hall of Famers Marcel Dionne and Wayne Gretzky must be enjoying their former team's success. I never thought I'd see the day that Los Angeles would get hyped up about hockey. When I watched Larry Brown tell Mike Greenberg and Mike Golic on Mike and Mike In The Morning on ESPN a few weeks ago that he had the itch to coach, I never thought it would be at Southern Methodist University (SMU). This move has some ironies for the 71-year old coach, who is the only person to win an NCAA and NBA Title. Brown is following a North Carolina Tar Heel, Matt Doherty, who compiled an 80-109 record in six years with SMU. It sounded obvious on Mike and Mike that Brown was determined to return to the sidelines after he parted ways with another North Carolina alumnus named Michael Jordan. Brown led the Bobcats to their only NBA Playoff appearance in 2009-2010 as Charlotte posted a 44-38 record. Do the Bobcats miss Brown? A few weeks ago, Charlotte finished with a 7-59 mark and now owns the worst winning percentage in NBA History at .106. The Bobcats concluded the 2011-2012 season with a franchise record 23-game losing streak. Jordan bombed badly letting Brown getting away while the Bobcats fans and City of Charlotte have a record the Philadelphia 76'ers were thrilled to give away. The last time a Jordan coach returned to college was when Leonard Hamilton piloted the Washington Wizards in 2000-2001 to a 19-63 record. Months later, Hamilton landed employment with the Florida State Seminoles. He has compiled a 201-127 mark and has led the Seminoles to four NCAA Tournament appearances. Ironically, Brown replaced former Detroit Pistons Coach Rick Carlisle and won his NBA title in Motown. Now Carlisle has an NBA title for the Dallas Mavericks. Is there enough room for Brown and Carlisle in Dallas? I doubt you'll see these two exchange phone calls or ever eat dinner together. The only thing they'll share is air time on the local news. There is no doubt that Brown will win at SMU. He's already getting rid of Doherty's players saying they're not good enough to play for him. He's already trying to find new schools for Doherty''s players. It will be interesting to see Brown face Hamilton in "The Battle Of Jordan's Castoffs" perhaps in the NCAA, NIT or any Holiday Tournaments. As for the Bobcats, the only thing they have to look forward to is the upcoming NBA Draft wondering if Jordan will ever get a pick correct since he bombed in Washington with Kwame Brown and in Charlotte with Adam Morrison. As the NBA Playoffs reach their latter stages, all Jordan can do now is just remember what it was like in 2009-2010 and realize this is a distant memory. More importantly, for a man who has won six titles and is in the Hall of Fame as a player, the words Hall of Shame describe where he is as an Owner/Executive. The Bobcats have a new arena, now they need a new result or putting fans in the stands will be like a pipe dream that gas prices will be $1.75 per-gallon.